The Different Girl by Gordon Dahlquist (Penguin - Dutton Juvenile) is one of the most interesting—and frustrating—books I read this year. Veronika is a girl; she lives on the island with her three sisters and Irene and Robbert. The girls’ parents died in a plane crash, and now, every day, they learn about learning…in a way that will tweak the brains of philosophers. They are observed, and they obey, and they struggle with a new idea: you must obey, but you must also decide. When May washes up on the shore, after a storm that disrupts the supply boat schedule, the girls must unravel this mystery: who is the different one? Or are they not different, any of them? The Different Girl draws from classic SF in a way that many YA books don’t in that it brings science and technology to the forefront, and it doesn’t wrap things up neatly, which is both a feature and a bug. Really, really trusts the reader. Philosophical questions are embedded here; a good book for that reader who still asks "Why?" An open ending (perhaps it’s a series; I prefer this as a standalone) that leaves room for discussion and imagination. Asks: what does it mean to be human? What does it mean to be different, and how is that constructed? Sybelle, assassin of the convent of St. Mortain, is Death's daughter--but she's also the daughter of d'Albret, who would kill you if the shadows on your face hinted of your disloyalty. Or maybe just because. 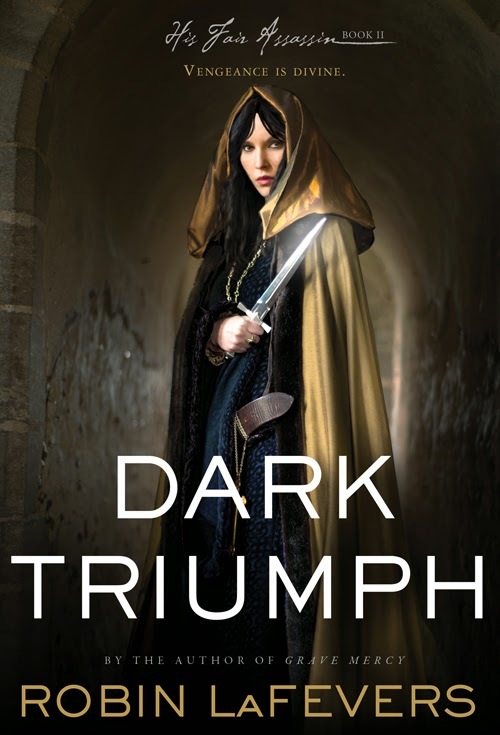 In the war for Brittany to remain separate from France in the late 1400s, the convent takes the side of Brittany, and sends forth its assassins, including Sybelle, to murder those who are marqued for death. Sybelle, however, is not easily led. She struggles with the rules of the game; she's not nearly the pawn others would have her be. When she has to flee with a mysterious knight who's been held in a secret dungeon, her mask is torn away, and she must fight openly. And somehow, she must be willing to face Death and all its attractions head on. 2. Subtle meditation on identity and faith wrapped up in a violent war setting. 3. Romance that does not require the heroine to take a back seat. 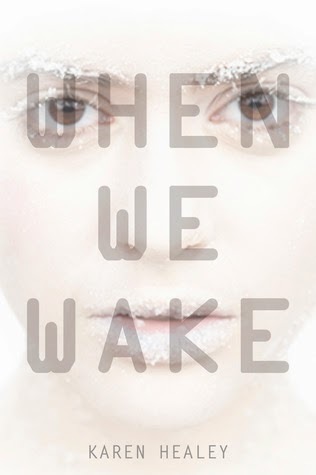 When We Wake by Karen Healey (Little, Brown - Books for Young Readers) starts off in the not-so distant future--and in Melbourne, one of my very favorite cities. Tegan is your average teenager (without that awful "normal" boringness that sometimes pops up before stories take off). She's going to a protest with her friends, and she's in her first breath of love, and she's got a lot of life left to live. The next thing she remembers is waking up...a hundred years later. It's not as simple as taking the next breath; Tegan has to decide what to do in the world she has to inhabit. 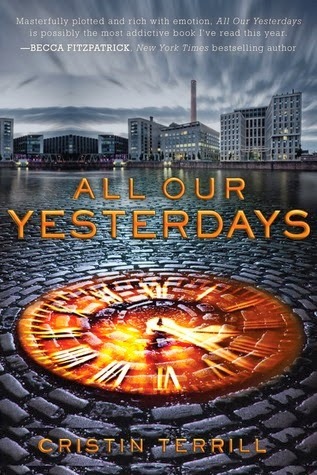 All Our Yesterdays by Cristin Terrill (Disney - Hyperion) wasn't in my most-urgent reading pile for the Cybils. The cover, while nicely done, fits the mold of a dozen other orange-blue "adventures" I've seen lately. But I thought I'd share this as an example of how all nominated books are being viewed and reviewed by the first round judges--it's great to open to the first pages and be surprised! After a bit of a mysterious start, the action is non-stop. Em is imprisoned. What she knows is that she dreads the drain, and that Finn, on the other side of the vent, is her whole world, the only person she can talk to. 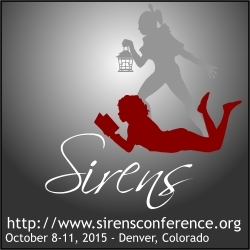 Then, one day, she steals a spoon and opens the drain, and finds a letter, to her--from her. And there's one instruction: kill him. 3. Questions about fate versus free will.